Hebridean Sky is the latest of three sister 'Sky' ships to be acquired by Gothenberg-based Salen Ship Management; the others are Island Sky and Caledonian Sky, which are similar, but not identical. All three are on a long-term charter to London-based Noble Caledonia, in which Salen also has a majority share. Where it gets complicated is that Hebridean Sky is also chartered out to a couple of other operators, one being Australian-owned APT, which in turn, has a stake in Noble Caledonia. 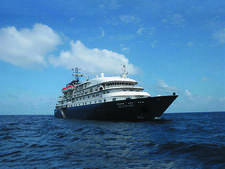 Some of the Antarctica sailings are also operated for expedition company Polar Latitudes. The experience passengers have will depend on the charterer and what it includes in the cruise fare, although this review is based on a cruise with Noble Caledonia. Passengers need to check inclusions carefully before they book. Hebridean Sky, which underwent a multimillion-pound refit in 2016 to bring it in line with its sisters, has a classic look, with a dark blue hull and white superstructure, and elegantly raked aft decks. The ship has a wonderfully traditional feel, with teak decking and, inside, gleaming wood panelling and highly polished brass rails. The ship was built in 1991 but really isn't showing its age, thanks to the refit, which even included cushioning the engine to reduce noise and vibration. 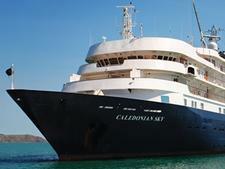 Like its sisters, Hebridean Sky is more reminiscent of a smart, country house hotel than a cruise ship, with generously sized cabins, comfortable, informal lounges, a beautiful library and a big deck, the Lido, for outdoor dining as an alternative to the single-seating main dining room. Because the ship has an ice-strengthened hull, it visits both polar regions and has a real feeling of being a smart little expedition vessel. The decks are named after famous explorers, including Shackleton and Scott, while the corridors are lined with beautiful photographs of polar birds and animals, all taken by the expedition staff themselves, as well as mini-exhibitions from the great explorers' legendary expeditions, some procured with the help of the Scott Polar Research Institute in Cambridge. The atmosphere onboard is very much one of culture, adventure and discovery. Noble Caledonia includes all tours and this certainly isn't a ship for slackers; more often than not, you're on the road by 8:30 a.m., visiting sights of cultural interest. There are regular afternoon lectures and sometimes, local entertainers are brought onboard, or everybody is taken ashore for a classical concert. Hebridean Sky may visit exotic locations but the home comforts are very much aimed at Brits, with Marmite and baked beans on the breakfast menu, Twinings tea in the Club, scones and clotted cream for afternoon tea every day and a traditional Sunday roast once a week. The whole vibe is comfortable, friendly and understatedly posh. If you're looking for nightclubs, spas, extensive sports facilities and West End shows, Hebridean Sky is not for you. What it's perfect for is an over-50s audience in search of a warm, comforting atmosphere that blends adventure with a genuine sense of caring and nurturing from the superb crew and expedition team. Noble Caledonia attracts a high percentage of repeat passengers, as much as 70 percent on some voyages, and there's lots of exchange of banter about previous cruises, and happy reunions with both crew members and fellow travellers. Most are well-heeled, highly educated, extremely well-travelled and adventurous. Most are over 60, and plenty of people travel alone and soon make friends. The predominant nationality is British, except when the ship is on charter to Australian-owned APT, when most passengers are Australian, or to Polar Latitudes, which sells mainly to Americans. Dress code is smart casual -- there's no requirement to dress up in the evenings, although most people change for dinner and a lot of men will put on a jacket. Daywear is decidedly practical; a lot of the tours include a fair amount of walking. Expect a mixture of shorts, sandals, sturdy footwear and functional outdoorsy gear, and when the ship is somewhere warm, a large number of Panama hats. There is usually one gala night a week, for which people make more of an effort and officers host tables. Women should pack a pashmina or wrap as the air conditioning can be quite fierce -- and, where possible, tables are set up outside and evenings can get chilly. For polar cruising, fleeces, hats and boots are provided and a full set of recommendations of what to wear is sent out in advance. All tips and service charges are included in the cruise fare, and there are no automatically added gratuities on bar bills or for treatments at the hairdresser. Tips are included for all drivers and guides on tours, too. The onboard currency for Noble Caledonia's cruises is British pound sterling. This changes to Australian dollars for an APT charter and American dollars for a Polar Latitudes voyage.